When a beer can was hurled at Marina Streznewski’s husband as he was walking on the street near their home, she decided to take action. The 54-year-old Foggy Bottom resident is banding together with other University neighbors to combat what they call the “increasingly rowdy behavior” of several students living off campus – a problem she and others said has reached its worst level in years. Streznewski, who has lived in Foggy Bottom for the last 11 years and attended GW in the 1970s, said most students, including the group of seniors who live next door to her on New Hampshire Avenue, are not disruptive. But the disorderly student-neighbors have gotten more egregious. “There has always been the occasional nonsense, but the frequency and intensity of parties this year are very aggressive,” she said. In an email chain on the Foggy Bottom community listserv Monday, local residents compiled a list of townhouses rented by students in the western part of the neighborhood – between 24th and 26th streets and down I Street and New Hampshire Avenue. They hope that by mapping out where students live and handing over the outline to the University, officials will take a more authoritative and proactive approach to quelling neighborhood disturbances. University spokeswoman Michelle Sherrard said the off-campus townhouses are under the jurisdiction of Metropolitan Police Department – not the University Police Department – but that the forces work together when necessary. “GWPD’s role in the surrounding neighborhood is to represent the university and to ensure students are being held accountable for their actions in compliance with the GW Code of Student Conduct,” Sherrard said in an email. She added that the University “engages in ongoing discussions with its neighbors” and directed neighbors to share their concerns through UPD’s Community Concern Hotline, though neighbors have complained that the response rate to their calls is slow. The department has responded to 76 neighborhood concerns, mostly noise complaints, so far this calendar year – 10 fewer than throughout 2011. A 70-year-old resident who asked to remain anonymous said some houses in the Foggy Bottom area – a handful out of about 250 townhouses in the neighborhood – are closely watched by the community because of occupants’ boisterous behavior. He said neighbors have witnessed young people vandalizing property and cursing and drinking in public, and many have complained that loud music and noises woke them up in the early morning hours. He said he has regularly met with University officials over the last “six or seven” years, but that GW does not always continue the same preventative measures – like nightly patrols that were nixed two years ago – from year to year. Georgetown University requires student who live off campus to attend an orientation program about proper neighbor etiquette and learn how to live “safely and responsibly off campus,” according to the school’s off-campus student life office website. Students who do not participate could be held back from class registration or face student conduct violations. 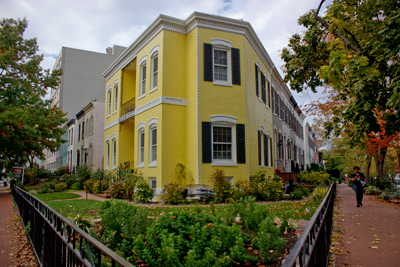 A large number of townhouses surround Georgetown University – meaning that students and permanent residents more often live next door to each other than in Foggy Bottom, sometimes causing clashes. Disgruntled Georgetown neighbors urged the city in June 2011 to draft legislation for the school to house all students in university-owned housing, either on or off campus, after a spike in off-campus related disturbances and behavior problems. Another Foggy Bottom resident who also asked to remain anonymous for privacy reasons said some neighbors give out brochures to GW students who move into off-campus townhouses. The 15-year resident added that information packets from the Office of Community Relations, detailing how to take out trash and be a respectful neighbor, have proved ineffective. Local residents do not want to come off as an angry mob of local residents and push students away from the neighborhood, she said. Due to an editing error, The Hatchet reported that a beer can hit Marina Streznewski’s husband. While the can was thrown at him, he was not hit. We regret this error. This article appeared in the October 25, 2012 issue of the Hatchet.